It's back to reality for me today (ugh). If you follow me on Instagram, you saw that I have been in Vermont for the past week for my cousin's wedding. I had such a great time! The weather was perfect and Burlington is such a cute little town! I am so sad to be back and to have to spend the day at work. Let's talk about this dress for a second. How cute is it?! Plaid is such a staple for me in the fall and I love the 3/4 length sleeves! It's a little bit oversized, so it's perfect for all body types! Super cute and I love the color. Bring on fall!! I love love love this dress with the hat! Cute look as usual girl. Love this plaid dress with those booties! 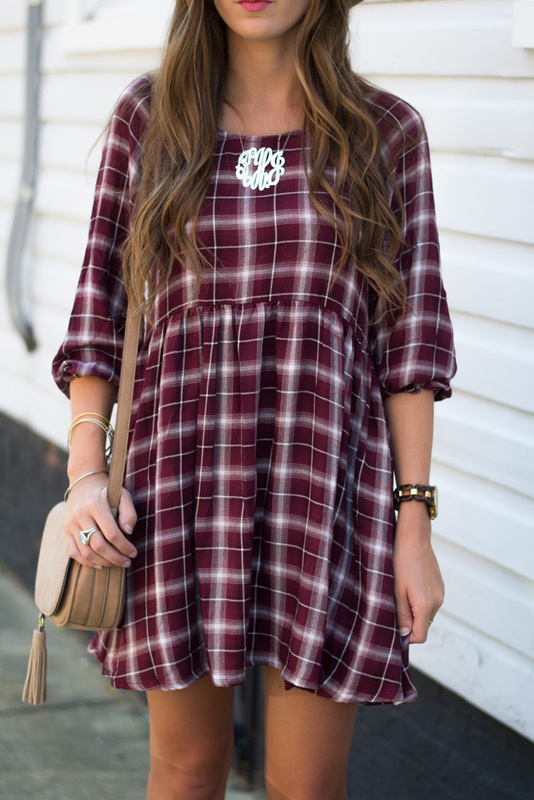 Love this plaid dress for fall! Super cute!! Love this look! & that purse is perfection! LOVE this dress! I think I may need it! You are actually the cutest, ever. Obsessing over this plaid dress. I think it would be quite nice for my trip to Vermont this October :) Hope you had a wonderful time there! I love this outfit so much! I would wear it in a heart bit! You're totally right - this dress is so perfect for fall! Love the plaid! Hi Kelsey, nice plaid outfit! My favorite part are the booties; perfect for fall! Gorgeous!! I love the color and the gathered waist! You look so ready for fall! Getting some major fall vibes from this look! Beautiful as always! Hey hey cutie! Loving this soft and easy dress. Looks SO GOOD on you!